The Margaret River Youth Precinct is undergoing a major redevelopment with over $2 million dollars of improvements planned for the site. This major transformation will see an expansion of skate, scooter and BMX facilities within the park as well as the addition of a new raised stage area for music events, parkour and play equipment, BBQ areas, shade, landscaping, spectator seating, public toilets and much more. Thanks to Margaret River Lions, Lotterywest, community contributions and the Shire of Augusta Margaret River for making it possible to bring nationally acclaimed facilities to our region. It’s thanks to Lotterywest retailers like the Margaret River Newsagency and Augusta Newsagency that we’re able to make this happen! Keep an eye on this Your Say project page for regular updates from the Youth Precinct Community Group about upcoming consultation events and surveys including development of a nature playground at the precinct. 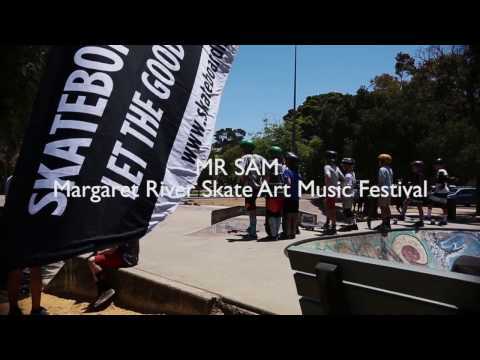 Come down and hear Nigel Anderson from the Shire of Margaret River and a representative from Soggybones Skate discuss the Youth Precinct development and the importance of these spaces within a community like Margaret River. Hear about all the features of this new exciting precinct and of course, skate it for the first time! Construction works have been progressing well to-date and the additional landscaping and shade shelter works are now underway that will finish the project within this stage of works. Shire Human and Community Services Manager Nigel Anderson said ‘with all things going well the Shire expects to have the site handed to the public by mid-May’. We have really appreciated the public’s patience during the construction period that has enabled workers to concentrate on completing the project as quick as possible. However, unfortunately there have been some people illegally entering the construction site, which has taken workers away from their important work to fix the damage that has occurred. I remind people that the Margaret River Youth Precinct is a construction site and those people found onsite without authorisation are in fact trespassing, so please respect the warning signs which are there for your own safety. Security surveillance cameras are being installed at the Margaret River Youth Precinct, which may be used to assist any trespass investigations. Again, thanks to everyone who has respected the site you will soon be able to enjoy arguably one of state’s premier parks shortly. Last light pole being installed today! Part of the fun, colorful shade structure went up this week! One of two shade structures in the park, the steel frames will form a wave along the west side of the bowl and over the stage. Landscaping along Walcliffe Rd will take place with the upgrade of the skate park and give the area a nice natural flare. To view designs, link below and select 'Walcliffe Rd Landscaping' document. Due to poor health and public safety concerns the three introduced gum trees on the Wallcliffe Road Reserve are being removed today with all the material being used in the Youth Precinct as mulch and nature play. Have you seen the latest photos of the pump track? Check it out in the photo library!! This is a pump track to be proud of! It is starting to take shape along the Western wall of the MRYP. For anyone who is interested, you can now see how the wave design is being incorporated into a fully functional pump track that aims to cater for all ages and abilities, from the first time skater through to the experienced veterans. Convic are the global leaders in skate park and youth space solutions and have created more than 700 action sport facilities around the world. From July through September Convic will be completing the design documentation for the MRYP. This includes everything from detailing design and user group workshops through to submission of plans for Council approval. This component of the process includes site set out, installation of temporary fencing, demolition, drainage and earthworks. Construction of the skate park, shade area, spill out area and landscaping are included in this component of the process. It's time for the communtiy to get behind the plans for upgrading the Margaret River Skate Park and surrounds by pitching in! The council has set a target of $25,000 for community funding that needs to be reached in order to get everything skate related in the proposed design! Click here to play video MR SAM 2016 Just in case you need a reminder of where we are coming from and going to!